Although he often restricts figures to elongated egg-shapes most likely to lay emphasis on his powerful colour contrasts, it has somehow made Mansa-based artist Victor Mwakalombe’s paintings stand out whenever he travels to the capital to exhibit. Employing a flatness of perspective, with intentional emphasis on a two-dimensional presentation of the picture surface, he makes no attempt at all to create an imagined depth of field. Typical is Stations of the Cross inspired by his Catholic faith it references a ceremony conducted by Lutherans, Anglicans and Catholics in memory of the suffering of Jesus of Nazareth in his last hours. The painting shows a congregation in a procession, the multitude is sandwiched by two planes an earthy ground and clear blue sky that help impose a sense of movement. 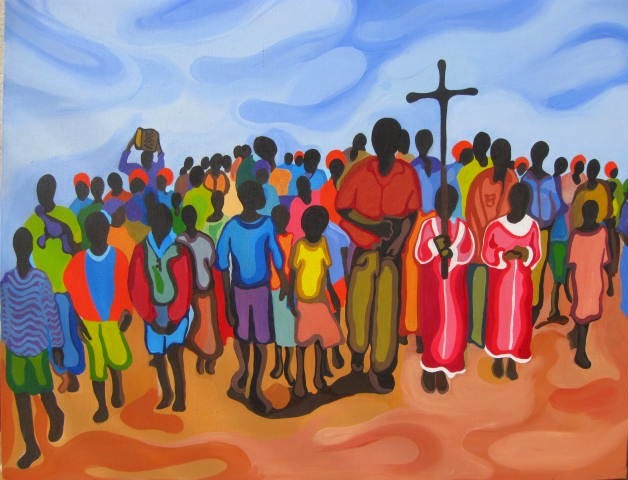 “I’m a Catholic Christian and therefore, I’m attached to some significant Christian events like Holy Thursday, Good Friday, Palm Sunday, and Easter Sunday, but apart from this I like to depict women and children in my paintings,” explains the family man who turned 41 two weeks ago. Works such as Mother Zambia show him pushing his inventiveness further where he depicts a group of figures that appear to be women at a water source, some drawing it and others carrying it away in vessels on their heads. Only a closer look will show the hidden map of Zambia embedded right in the centre of the painting. The work reflects the country’s abundance of natural resources, complimented by the title, it bestows a motherly role on the land, suggesting how she is able to provide for her children. As much as he can go the realistic route especially when working on commissions, like many abstract painters, he maintains he can best express himself in what he describes as his “flowing style”. Mwakalombe however complains that as much as he is inspired, it is unfortunate that he has to travel to Lusaka for his art materials, the 12 hour bus journey (one way) is not only tedious, but even when he gets to the capital at times he will not find everything he is looking for, particularly certain types of the acrylic paint that he favours, it so happens that at times the only two stockists are out of certain shades. But the challenge does not end there. “There is a serious lack of art market and materials in Mansa except for the few members of the American Peace Corps community who ask for work on commission after a couple of months and sometimes after years,” he says echoing the outcries made by fellow artists Samuel Mabuku and Aubrey Chali who are also based in Mansa. This brings to light the fact that there is a small band of very inventive artists in Mansa, even as a rural town, it appears to be the most active small town outside Lusaka which is probably the reason Mwakalombe believes as a provincial headquarters it deserves an art gallery. But as much as the artists in Mansa are all fired up and motivated, living on their paintings alone would mean becoming penniless so they have to make ends meet through other efforts. “I have a great deal of passion but unfortunately I can be destitute if I entirely depend on art hear in Mansa unless in Lusaka, so for survival’s sake I decided to run a small art studio called Diversity Expressions with my friend Collins Kangwa. The Studio deals with authorized pressed car number plates, T-shirt Printing, date stamps and outdoor signage,” he explains also sharing where he gets the inspiration to continue working. Among his fellow artists, he is inspired by Mulenga Chafilwa, Chulu Zenzele, the Yombwes of Livingstone, the late Bright Chishimba, Poto Kabwe, Style Kunda, Stary Mwaba, Michelangelo and Leonardo Da Vinci. Mwakalombe is a self-taught artist but after completing school at Kawambwa Boy’s Technical Secondary School in 1994 he has consistently attended workshops and exhibitions in Lusaka, Livingstone and Mansa and has also served as the elected provincial secretary of the now defunct Luapula Visual arts Council, this year he participated in the Golden Jubilee National Art Exhibition at the newly opened Livingstone Art Gallery where a few of his works are still on display for purchase. “Nga waumfwa ubwite bwa mfumu, wasuke muchinshi muchinshi, wasuke auti Kalombo Mwane (When you hear the call of the LORD, answer with respect, answer saying Kalombo Mwane),” chants an all-male choir setting the tone for Eighteam the new documentary on the football in Zambia, a Spanish and Zambian co-production by writer, director and producer Juan Rodriguez-Briso of Omnicorp Estudio and co-producer Ngosa Chungu of Purple Tembo Media. The words Kalombo Mwane are a Luvale expression of gratitude, thanks and respect, often reserved for a respectable figure such as chief, king or distinguished elderly personality. It can also be used in varied day-to-day contexts as an expression of thanks, accompanied by the traditional clapping of hands and curtsying. As the film unfolds, it is revealed that this skilled choir is in fact the Zambia national team, the African Cup of Nations 2012 champions who have adopted the song to heighten morale and invigorate their spiritual faith while in camp and just before matches, they take it as a devout hymn to commit their sporting efforts to God’s will. Fringing on a gloomy dirge and an uplifting spiritual the song sets the stage for a poem recited by a pensive Kalusha Bwalya (Football Association of Zambia President and, seen like before, clad in a suite gazing reflectively upon the names of the players (many of them his personal friends) and crew that died off the coast of Gabon on the monument dedicated to their honour at Heroes Acre, and as the acapella and clapping die down, Bwalya poetically recites a rendition of the tail of the Phoenix, the mythical bird that rises from ashes to triumphantly fly again. Such is the mood of the film, it lifts the viewer high and low, undulating from point to point, from grief to promise, victory and glory. Although it is technically segmented into several brief titles, such as A Golden Generation, Duty Calls, The Chipolopolo are back, An Era Ends, Weathering the Storm, What is Your Dream, Destiny Calls and Gear 6, it is loosely segmented into three main parts. The first takes the viewer back to the Olympics, Seoul 1988; when a little known Zambian side humiliated a star studded Italian side 4 goals to 0 in a clean David and Goliath moment, the Italian side already had about five players in Italia Serie A from Napoli, Juventus and Milan but were no patch for the Zambians. “They had a pattern of play we didn’t expect”, confesses Lazio and Milan legend Mauro Tassoti in the footage “[…] a football without burdens or restraint, a natural football”. “We hardly touched the ball, I must say it was like the wrath of God” adds Ciro Ferrara his countryman who had about 500 caps between his Milan and Juventus during his on pitch career. The footage of the 1988 match also gives a nostalgic glimpse of a younger Dennis Liwewe in the commentary box. Liwewe is in fact one of the main contributors to the narrative throughout the film. Anyhow, in the second part, from the glorious event of 1988 the film nose dives into what is the saddest bit. The Gabon crash, it takes us into a build-up before the crash, by means of personal accounts from journalist Chanda Kristensen who was on the plane but has to stay behind when it changed route. Former Football Association of Zambia boss Simataa Simataa also gives an exonerating account that reminds us what critical role he too has played in the history of Zambian football, in the film, it is he that gives a pointed reminder to the viewers that official findings on the crash have never been made public. Bwalya gives an emotional account of how close he was with the players that perished, with whom he had started his career; he was scheduled to meet them while playing in Europe at the time. 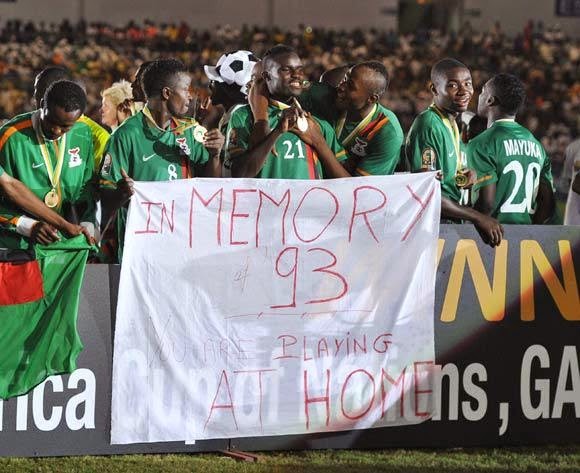 It is Liwewe however who gives a tearful, operatic speech in some footage when he was seen on television beckoning young Zambian footballers to take up the challenge of volunteering for a new national team after Frederick Chiluba declared that the show must go on after he led the nation in mourning. Roald Paulsen, the coach brought in to rebuild the team with the help of the Danish government also makes an appearance sharing how challenging it was to rebuild a team from scratch in 6 weeks. 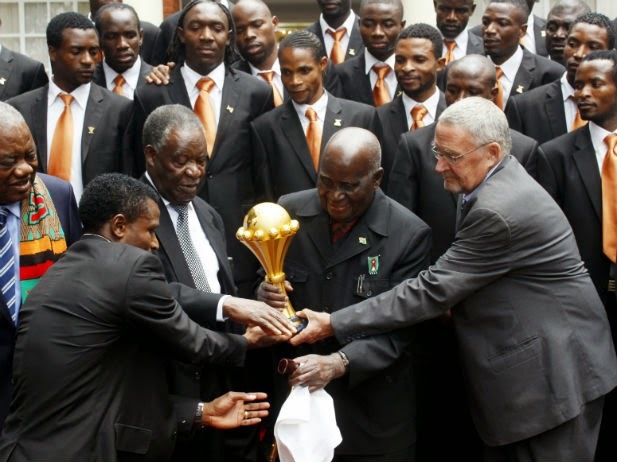 The third part of the film highlights more recent events the, AFCON 2012, where Zambia emerged victorious as unexpected underdogs. But other than focus on the glory itself, it gives a touching insight into the overwhelming pressure that was on the team. Players, Christopher Katongo, Kennedy Mweene, Emmanuel Mayuka, Christopher Katongo and Hijani Himoonde share their personally experiences in fascinating conversations giving us a feel of how it felt to be in their boots. during a ceremony at the State House in Lusaka February 14, 2012. Eighteam captures the essence of what drives the national team, which is what perhaps drives Zambia as a nation which is spiritual faith, teamwork, hope for the best and the ability to achieve. The film can come at no better time than this as the nation celebrates a jubilee, mourns a president and experiences a spasm of political uncertainty. It reminds us that Zambia has risen from the ashes and overcome her challenges before and this was done by working together. It is certainly a film that Zambian’s will definitely be watching for the rest of their lives. It premiered on the 16th of October 2014 at Fresh View Cinema’s Levy Park where it has been showing twice weekly. Artistic rights, freedom of expression and the creative sector’s contribution to social and economic development are among the key issues on the agenda of this year’s annual African Creative Economy Conference scheduled for Rabat, in the Kingdom of Morocco from 13 to 15 November. He states AN is strongly lobbying to make sure that Culture will be inscribed as an essential instrument in the post 2015 Sustainable Development Goals. Conference speakers include two African Ministers of Culture, Mohammed Amine also of the host country and his counterpart Ama Tutu Muna from the Republic of Cameroon. A few more of this year’s high level presenters are Pitika Ntuli, Professor Extraordinaire at Tshwane University of Technology, a South African sculptor, poet and writer who spent 32 years in exile, Touria el Glaoui the Moroccan founder of the 1:54 Contemporary African Art Fair that is annually staged in London and Timbuktu born, fashion designer Alphadi nicknamed “ the Desert Magician ”, Director of the African Federation of Fashion Designers and founding member of the International Festival of African Fashion initiated in 1998. Rapidly becoming one of the largest meetings of the creative sector in Africa, the wide range of delegates from the continent and beyond will be looking at issues such as “Strengthening Synergies between Government and Civil Society, unpacking the UNDP/UNESCO Creative Economy Report and Challenges of the Post- 2015 Development Agenda for Africa”. Additionally, entrepreneurship in the creative sector, regional strategies and public-private partnerships insights as well as success stories from leaders representing the art disciplines will all be part of this year’s attention. As much as these are thematic discussions set for the event, there is no telling where they will twist or turn and what debates and observations may spring forth as was the case during last year’s session in Cape Town where for instance the Sino-African relations aroused some apparent deep seated aversions among the delegates. Senegalese scholar, Dr Daouda Cisse, a research fellow at the Centre for Chinese Studies, University of Stellenbosch in South Africa highlighted the recent unprecedented increase in trade between China and Africa in his conference paper in which he indicated that China is now Africa’s largest trading partner, and it was essential that the continent jointly develops and implements a clear strategy on how it engages with the most dominant of the eastern tigers. The paper speculated an imbalance in the partnership that was negatively predisposed towards Africa. However, at the same event Dr Marina Guo, Vice-Director, John Howkins Research Centre on Creative Economy, Shanghai presented a paper that convincingly contested those notions in an honest piece of guidance on breaking down the barriers to doing business in China with particular emphasis in the areas of arts, culture and the creative industry. Last year’s conference also saw artistes from across the continent share their inspirational success stories of projects that have been fruitful -- with very little or no support from private or public funding -- among these were Nigerian, Omoyemi Akerele, Creative and Managing Director, Lagos Fashion and Design Week. Also the founder of Style House, a fashion development agency that focuses on “giving everyone in the creative chain” an opportunity to benefit from the lucrative aspect of fashion. Suzanna Owiyo, an award-winning Kenyan singer-songwriter and musician who fuses western style pop with traditional African instruments shared how she is providing up-coming artistes with recording space at her studio in her native Kisumu. Didier Awadi from Senegal, an award-winning rapper and prominent figure in Francophone Africa’s highly lucrative hip-hop scene explained how his label, a film and music production house called Studio Sankara has over 50 full time employees, making him a champion of poverty reduction and job creation using the creative arts and Siphiwe Ngwenya former member of South African hip-hop group Skwatta Kamp from the slums of Johannesburg, introduced the Maboneng Township Art Experience a modest initiative emerging from rejection that transforms ordinary homes into art galleries. Such is the diversity of the creative economy conference. Zambia’s art scene has for a long time been in need of another book to share the shelf with the 2004, Gabriel Ellison title Art in Zambia. The nation has repeatedly been skimmed over by art historians and international curators consequently being omitted from important publications that have often focused on neighbouring countries creating a gap in literature on art. From colonial times when the west had just begun to display what is called ‘tribal art’ in museums, there had always been a preference to catalogue artefacts from countries such as the Democratic Republic of Congo and Angola (Chokwe masks) and Tanzania (Makonde wood carvings) across the border. When the focus shifted to ‘modern art’ again concentration was on Mozambique, with artists such as acclaimed painter Malangatana and the sculptor Chissano, being well documented. Zimbabwe too has many books written on its now world famous tradition of stone sculpture. So the new book Zambia: Implosion for Explosion comes as a pleasant gesture. 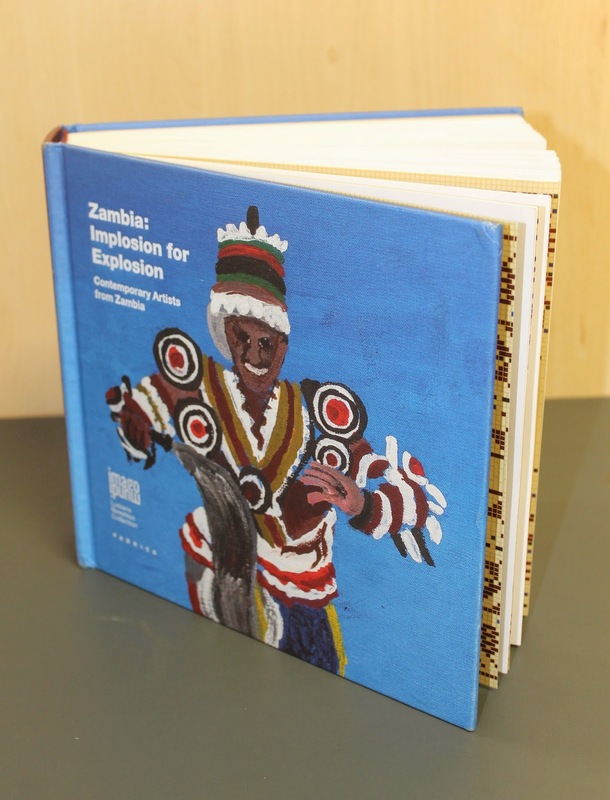 Written in both English and Italian it is designed as a catalogue for part of Italian tycoon Luciano Benetton’s international collection, featuring the works of 162 individuals listed as Zambian artists. It has no chapters per se but a collection of five short commentaries on visual arts and the socio-economic environment of Zambia among other things, one is attributed to Benetton himself. The other contributors are emerging Italy-based curator Abdulmalik Mabellini and Zambian artists William Miko, Clare Mateke and Mathew Mudenda. But the well bound, 300-plus page, hard cover book is somewhat problematic when issues such as context are taken into consideration. Of course the book is part of the Italian clothing and investment mogul’s “Imago Mundi,” Latin phrase for “image of the world” project where by 2016 he plans to collect the work of 10,000 artists from 60 countries, but it raises questions on the publication’s true purpose, particularly on how the Zambian art scene is portrayed and essentially how the publication came into being. In his introduction, Benetton describes the 162 participating artists as “afronauts”, a term coined by the Zambian visionary Mukuka Nkoloso who hoped to send a girl and two cats to the Moon and later Mars in a space programme under his independent National Academy of Science, Space Research and Astronomical Research in 1964. Benetton suggests as afronauts Zambian artists are exploring a country undergoing massive change. Comparably, although it is not mentioned in the book, anyone passingly familiar with We’re still going to Mars a body of work by painter Stary Mwaba that explores Nkoloso’s concept is also the basis of his ongoing residency at the Künstlerhaus Bethanien in Berlin. However, in the text Benetton also illustrates Zambia’s geographic location and mentions a few things from urbanization to Chinese investment, after remarks on the “impressive” Victoria Falls he explains how his collection intends to provide Zambian artists with much needed international exposure. But the impression throughout this piece of writing echoes a tone of discovery, the encounter of a faraway land the world knows very little or nothing about. Mabellini picks that tone up like a baton in the subsequent write-up as he opens suggesting that while the world has been ignoring Zambia, it’s art has been flourishing under very harsh circumstances such that artists are forced to use materials such as “garbage”, “old bed sheets”, “car paints and burlap” (in those exact words) for their art production. Before he too lands at a description of the Victoria falls, he makes quick work of giving a historic overview of the art scene in what appears to be a two paragraph summery of Ellison’s Art In Zambia in proper sequence from her tackling of the art that was introduced by European settlers through to Tavern art and ending at Stephen Kapata so beloved by foreign collectors because of the perceived innocence and naivety of his style. Nevertheless, concerning the use of discarded materials, there are only a handful of artists practicing in this genre. The average Zambian artist uses imported and highly expensive paints, inks and canvases some from Italy itself. Even so, global trends show that use of the “found object” has been on the increase in art production particularly in the light of environmental awareness. Just last year the Financial Times announced the London auction house Bonhams achieved a record US$850,000 for a tapestry by celebrated Ghanaian sculptor and scholar El Anatsui Africa’s highest grossing artist made out of trash in the form of flattened beer cans and bottle tops, Kenyan artist Cyrus Kabiru too is also causing an international sensation with his re-purposed materials. What appears to be happening with the book is a kind of fetishization, a search for the exotic or perchance the primitive. While Mateke, Miko and Mudenda’s contributions provide more practical observations in short essays entitled Art in Southern Zambia, Zambian Art Must Implode to Explode and Copperbelt Art respectively, after these are a few pages of select images, which again seem awkward. Some show the Bush Art Gallery and the Mosi-O-Tunya Art Centre two roadside art shacks in Livingstone which sell inexpensive tourist art – like seed and straw mosaic -- that lacks the conceptual thought or complex production processes of mainstream contemporary art practiced by a good number of the 162 artists featured in the book. Images of the country’s most outstanding and comprehensive collections such as Andrew Sardanis’ Chaminuka, John Kapotwe’s Namwandwe or Enzio Rossi’s Villa Lucia that have hundreds of the best paintings and sculptures between them are omitted as are gallery spaces like the Henry Tayali Gallery, Twaya Art Gallery and the cutting-edge 37d Gallery which on opening night can rival any overseas gallery by standards of display. In light of this one gets the feeling that images of these spaces were omitted in order to cast a shadow of parochial simplicity on the Zambian art scene? As earlier noted, the manner in which the book was put together also raises a few concerns. Early this year, Mabellini was tasked to engage a minimum of 140 artists through Zambian contacts with whom a call for participation was made with the promise of a great opportunity for international exposure. Through the Zambian contacts, artists were called together and when he flew in, each one of them was provided with a small, postcard size canvas of 10 x 12 cm on which they were tasked to create works of art. The artists never received any brushes, inks, paints or indeed payments beyond the promise of having their work exposed in an exhibition abroad. But perhaps a little monetary gain for them would not have hurt considering they were contributing their work to the collection of a person whom Forbes lists as one of the richest men in the world with a net worth of US$ 2.6 Billion dollars. The tiny canvases are a clever gimmick because obviously all 162 of them must have been able to fit in one bag which may have even been carried on to the plane to Italy as hand luggage. Meaning someone was able to fly in and out and collecting 162 samples of art by Zambians at the cost of an air ticket and of course decent accommodation. What is probably aggravating is the fact that Zambia has some of the finest realistic painters anywhere in the world and a few of them such as veteran Vincent Maonde of Livingstone or the younger Caleb Chisha of Lusaka are in this book but the works they submitted are perhaps among the worst of their careers, think of it as a worst works competition. Here, one also wonders how much time the artists were given to complete these works, photographs in the book show some Livingstone-based artists working in groups as if being watched over, one artist from Lusaka however confirmed that he was given between 10:00hrs and 16:00hrs to conceptualize and execute the work. Be that as it may the artists in the book, are all jumbled together regardless of career level, genre or alphabetical order, it is one thing to have an all-inclusive publication but half the artists in the book hardly practice or exhibit publicly and many of them are in actual fact students in both secondary school and higher learning institutions who happened to be in the right place at the right time when the call for artists was made. Zambia may be in need of international exposure but it is not entirely invisible to the global art scene. For years, by individual efforts, artists have continuously represented their country on the international circuit. This year alone for instance Lusaka-based Lawrence Chikwa featured prominently in the blockbuster exhibition “A Divine Comedy” set up by international curator Simon Njami at the Frankfurt Museum of Modern Art. Closer to home, Lusaka’s Zenzele Chulu and Norway-based Victor Mutelekesha are featured in !KAURU a roving SADC exhibition that opened at the University of South Africa (UNISA) which seeks to address “African identity, modernity and contemporaneity” questioning who has a right to speak for or represent whom. Needless to mention in 2009 when only aged 30, Anawana Haloba exhibited at the 53rd Venice Biennale, the world cup of art. These are just a few. Zambia’s idiosyncrasy therefore should not be so much the artist’s choice of material, but the fact that they can use it to produce both simplistic and conceptually complex works for local or international intake depending on the situation. Had Mabellini done a little more research or stayed in the country a little longer than the nine days in which he had to travel from Livingstone, Lusaka and the Copperbelt he would have grasped a more realistic understanding of the substantially fragmented but pulsating art scene that the book masks. It must be noted also, that this is not the first time Zambian artists are being featured in a catalogue of an international private collection. In 2005, the works of Flinto Chandia, David Chirwa, Enoch Illunga, Stephen Kappata, Fackson Kulya, Style Kunda, Teddy Zebbie M’hango, William Miko, Adam Mwansa, Godfrey Setti, Shadreck Simukanga, Henry Tayali and Friday Tembo were featured in Transitions (Botswana, Namibia, Mozambique, Zambia, Zimbabwe 1960 -2004) one of four exhibition catalogues for the Robert Loder collection that was shown at The Africa Centre in London. It was a culmination of the Loder funded Triangle Art Trust Workshops and exhibitions. In Zambia: Implosion for Explosion however, the works appear to be dangling with “no explanation of the thematic development of contexts”, possibly by design all is left to the readers’ imagination. All in all the book is a hasty interpretation of the Zambian art scene through jaundiced Western eyes. The question Zambian artists should really ask themselves is whether the way they have been portrayed in this book is how they would like to be seen by the rest of the world. As for the authors, there would have been no harm to also borrow from the comprehensive texts in the Lechwe Trust Catalogue by Cynthia Zukas, Roy Kausa and Miko that provide a detailed account of art in Zambia from the 1960s until the present. Zukas has been a practicing artist for over 50 years and was even knighted for it, Kausa has been writing on art for over 30 years, citing such a publication along with Ellison’s work or interviewing these individuals would have surely strengthened the new book contextually, is it not the whole purpose of a bibliography. Zambia: Implosion for Explosion is easy to read but not engaging or interesting enough to pick from the coffee table for a second read. Was it enough to satisfy the commission of the collector? Yes. Is it a true portrayal of the Zambian art scene? No. Nonetheless, the book borrows its title from the text Miko provides. It is from a concept he first shared in a presentation during the 15th Triennial Symposium on African Art by the Arts Council of the African Studies Association hosted by the University of California, Los Angeles in 2011 where he likened the Zambian art scene to something that is undergoing internal combustion, it is a theory linked to "Kundwe" out here! : it is always darkest just before dawn” a critical analysis of the state of Zambian contemporary visual art developments he delivered during the International Association of Art Critics symposium held at the University of Cape Town in 2007. The theory around these two papers are also the driving force behind the concept “Correcting the national anomaly” in which Miko implies the way to a better art scene in Zambia is through education. Fuelled by that viewpoint, alongside fellow artist and scholar Billy Nkunika, they were the key figures behind the graduation of the first Bachelor of Fine Arts Degree holders to be produced locally through the Zambia Open University in September this year.